With a processional led by a contingent of bagpipers, Misericordia University welcomed 412 first-year students during the annual convocation ceremony on Thursday, Aug. 23 in the Wells Fargo Amphitheater. 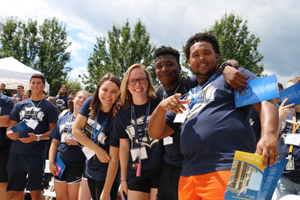 Misericordia University received 1,935 applications for the first-year class, which hails from nine states, including Connecticut, Delaware, Georgia, Maryland, New Jersey, New York, Pennsylvania, Rhode Island and Virginia. They hold an average high school grade point average of 3.42 with a median SAT score of 1126 and 23 on the ACTs. The university also welcomed 72 transfer students. With the new class of students, the university will have more than 2,570 undergraduate and graduate students in full- and part-time academic programs for the fall semester. Misericordia has 960 students scheduled to live in residence halls and townhomes on campus. The convocation program included a welcome by Misericordia University President Thomas J. Botzman, Ph.D., and an address by Stephanie J. Anderson '68, the founder and retired president of Knowledge Design Group, a national performance consulting and learning services firm based in Emmaus. During the convocation ceremony, Misericordia University Alumni Association President Mark Oberstaedt '89 presented Mrs. Anderson with the Mother Mary Catherine McGann Achievement Award. A graduate receives the honor for distinguished and sustained career accomplishments. 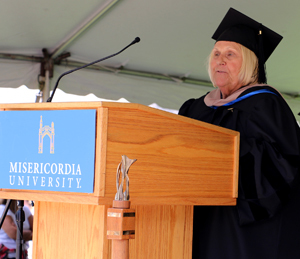 Having recently celebrated with her classmates at their 50th reunion in June, Mrs. Anderson said that as a first-year student 54 years ago, she never imaged where her Misericordia education or career would take her. "The fact that I am here today, speaking to you is no doubt a surprise to some of my classmates, as well as to me. The point I would like to make ... is that undergraduate work is a time to lay the foundation to begin your career, support future career growth and successes in your life." Referencing a quote from William Shakespeare, "We know what we are, but not what we may be," she explained how her career path changed during her time at Misericordia. "As I was participating in the convocation ceremony as a freshman, I thought I would become an executive assistant in business. At that time, for a woman to think of doing anything other than being an assistant in business was unimaginable,'' she said. "I chose education as a minor to please my father, who thought teaching was the perfect job for a woman. While student teaching my senior year, I discovered the joy of teaching others. "This was not a direction that I considered as a freshman, sophomore or junior. This was a startling revelation to me. And, as it turned out, it was a good thing, as these were the courses and experiences in education that laid a foundation for my future career,'' Mrs. Anderson added. "Another important result of this experience is that I spent my life doing something that I loved." Mrs. Anderson encouraged the students to explore the opportunities presented to them and be ready to embrace change. "While at Misericordia, I was challenged often, but with the support and guidance of a caring community and excellent professors, and I had experiences to support the challenges I would face. I was launching a new career that flourished because of the values and fundamentals I learned while at Misericordia – a career that flourished because I embraced change and used it to create a successful business," she said. Mrs. Anderson earned a Bachelor of Science degree in business education from Misericordia University in 1968. Soon after earning her degree, she accepted a teaching position at Emmaus High School, where she remained for the next 10 years. In 1980, she made a career change and joined ComputerLand, a national reseller of personal computers, as training director for the Lehigh Valley Group. At ComputerLand, she designed one-day seminars for business executives, before branching out and developing learning programs for use across the network. Capitalizing on new developments in technology, she combined her education and training skills to develop and work for a series of companies on the cutting edge of computer training and education. She is credited for developing industry-leading technology training seminars and applications that were used by computer giants, Microsoft, Apple and IBM to provide learning solutions for Fortune 500 companies. In 2001, Mrs. Anderson and her husband, Dr. George Anderson, Ed.D., launched Knowledge Design Group, Inc., to provide learning solutions consulting to companies, school districts, and government agencies. The couple's services included frontend analysis, instructor and facilitator certifications, instructional systems design, authoring, project management, and evaluation and measurement services. Knowledge Design Group has designed and delivered leadership programs for many Fortune 500 companies, including an online training program on ethics and compliance, an online certification-testing program, and a protocol for evaluation and measurement of training for a large health care network. As a retired executive, Mrs. Anderson shared with the students six pieces of advice she says she wishes she took more seriously as a student. "The first is to have a vision and a plan to support that vision," she said. "The vision and plan will change frequently, but it is a valuable first step to achieving success." She encouraged the students to reach for excellence in all they do and be a good team player, both in academics and athletics. She also encouraged them to ask for help in their search for best practices, reaching out to faculty, coaches, teammates and fellow students for help. In addition, she suggested they engage in prayer or a mindfulness activity daily. "Have fun and choose to be happy," she added. "The one thing that has not changed and dominates Misericordia then and now is the commitment to give students the attention they deserve in order to be successful in life and their careers through development of the whole person. That includes values, ethics, academics, music, art, sports, and experiential learning activities," she added. "My career has been transformative, and because of my Misericordia experiences I believe that I have led a life of consequence in my profession. It has been an adventure. It has been a challenge. It has been fun. It has been rewarding. I wish the same for all of you." 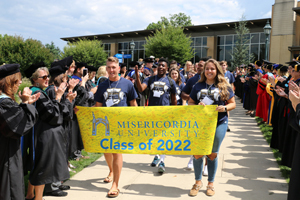 The convocation ceremony welcomes first-year students and their families to Misericordia University, and acts as the official start to the new academic year. Orientation begins later in the afternoon and continues until the first day of classes on Monday, Aug. 27. 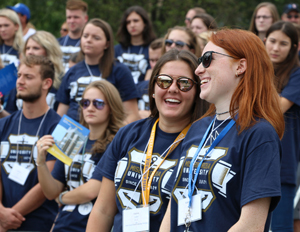 The orientation program includes the Orientation Day of Service in which first-year students and other members of the campus community volunteer in the region.